and an outfitter organizing everything from fishing trips to zip-line adventures. and Smoky Mountain National Park. Secretary of State William Jennings Bryant pronounced The Omni Grove Park Inn “built for the ages” when it opened in Asheville, North Carolina, in 1913. He was right. Subsequent decades found everyone from Harry Houdini to Eleanor Roosevelt to George Bush to Michelle and Barack Obama inspired by the words of Ralph Waldo Emerson and others inscribed on the lobby’s granite walls. Groups visiting the 161-acre Grove Park Inn today still find inspiration in the Great Hall lobby and lounge but also in the Grand and Heritage Ballrooms, venues with more than 25,000 square feet of space for modern trade shows and exhibits. The 42 conference rooms meet every need, from theater- and classroom-style assemblies to board meetings, lunch breaks, and banquets. Three guest wings—the historic Main Inn and contemporary Sammons and Vanderbilt Wings—hold 512 four-diamond accommodations. Particularly notable lodgings include one-of-a-kind suites with themes including Fabulous Fifties, Swinging Sixties, Gatsby, and Fitzgerald and a vintage three-bedroom, freestanding cottage ideal for small executive retreats. 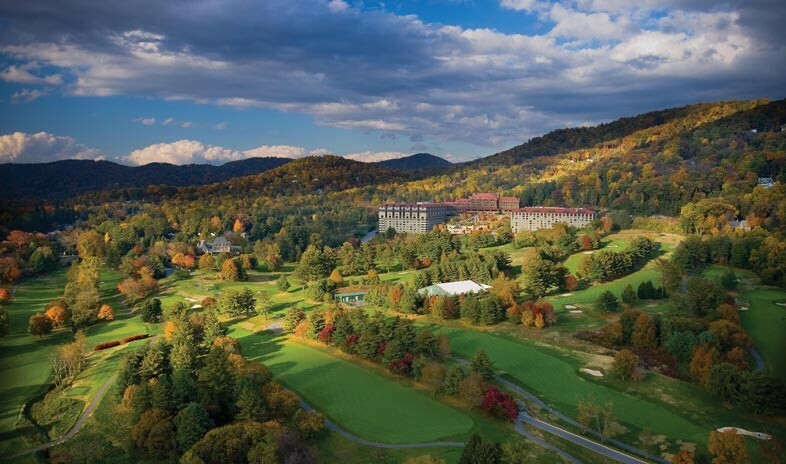 Five restaurants, live music and comedy, an award-winning spa, sports complex, and Donald Ross–designed golf course headline a long list of incentives—rivaled only by the timeless beauty of the surrounding Blue Ridge and Great Smoky Mountains. An outpost of the Nantahala Outdoor Center welcomes groups on-site, offering everything from guided fishing and white-water thrills to zip-line adventures.